Located on the illustrious Eiermarkt square, a favourite to any beer lover, this tranquil café immediately catches your eye. Bar des Amis is built in a traditional manner, complete with wooden bar chairs, a sturdy bar you can lean on all night long, and a great atmosphere that will keep you coming back. A paradise for beer lovers! 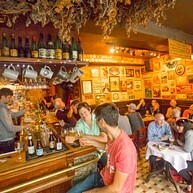 The bar is where locals and tourists find each other and fraternize while tasting one of the 300 Belgian beers. It’s no coincidence that the café has been elected one of the world’s 20 best beer cafés! A popular village café in the middle of the city. That’s Café De Reisduif in a nutshell. In other words, an authentic place with a pleasant atmosphere where it doesn’t matter where you’re from or where you’re going. 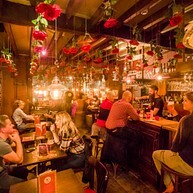 Café Rose Red is a cheery café that is full of character. 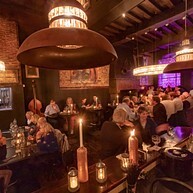 It is located in the heart of Bruges, a stone's throw from the Markt Square. A quiet side street takes you away from the tourist route and spirits you away into an authentic jewel in the town centre of Bruges. Their speciality is Trappist beer; hence they offer all the trappist beers that are recommended all over the world. Come savour this delectable nectar inside the café or on the pleasant terrace. 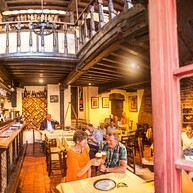 Even though its roots go all the way back to 1515, making Café Vlissinghe the oldest café in Bruges, it is still full of life. In summer you can even play a game of pétanque in the garden. Concertgebouw, where you can enjoy concerts, plays and dance performances, also has a nice city bar. Perfect for those who want to have a cup of coffee in the afternoon or enjoy a glass of wine at night. Huis Craenenburg has dominated Bruges’ Markt square for centuries. Margaret of York watched the tournaments from this establishment, and it is also where Maximilian of Austria was imprisoned. 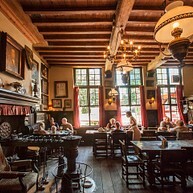 Today it is the place to be to enjoy a drink and a bite to eat in an authentic Flemish atmosphere. This Irish pub is the place to be for Irishmen who are far from home and for anyone who likes to have a Guinness once in a while. You can also have a bite to eat before or after the drinking fest. De Garre lies hidden in one of the smallest streets of Bruges in the shadow of the Belfry. 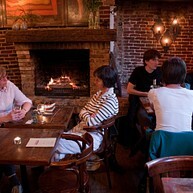 This small and cosy pub offers you different kinds of beverages, including the exclusive 'Tripel van De Garre'! Jazz, blues, chanson or a bit of rock 'n roll, De Lokkedize doesn’t discriminate. So it won’t surprise you that it is a place where both residents and visitors like to sit and chat. 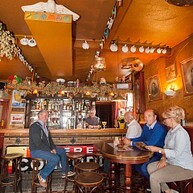 An established venue and the favourite bar of many inhabitants of Bruges. 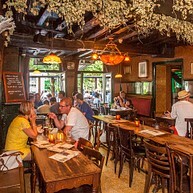 L’Estaminet is famous for its authentic interior, its delicious bar snacks and its perfectly pulled beers. Now and then the tables are moved to the side to make room for dancing, which goes on until the wee hours of the morning. 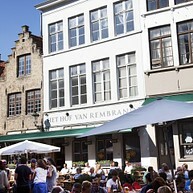 Another classic on Eiermarkt square is 't Hof van Rembrandt, blessed with a lovely sun terrace and an impressive beer menu. From trappist and abbey beers over fruit beers to the beer of the month. Make your choice! All of Bruges’ outdoor cafés are extremely popular, but that of 't Klein Venetië beats them all. It’s an ideal spot to relax in the sun with a wonderful view of Rozenhoedkaai. This is a new coffee house, but it has plenty of old-world charm. A paradise for coffee-lovers, who know their filter-coffee from their espresso and their latte from their cappuccino. Tea-lovers will also find an impressive range of choice, while those with a sweet tooth can opt for a white hot chocolate. Trendsetters may prefer an ice-cold coffee shake, whereas the true hedonists will undoubtedly go for a refreshing glass of cava. If you want to enjoy the sun for as long as possible, you should hurry to Punta Est to make yourself comfortable in the setting sun on the corner of Predikherenrei. It is without a doubt one of the city’s best kept secrets. At 't Zwart Huis, a listed monument dating from 1482, you kill two birds with one stone. On the first floor you can have a bite to eat, and below cocktails are served at will. A place where you’ll never be bored.